The world’s population is aging. In 2015, 901 million people were aged 60 and older. By 2050, that number is expected to more than double, reaching nearly 2.1 billion. According to the United Nations, this shift is poised to become one of the most significant social transformations of the 21st century. To address the needs of this aging population—and a looming shortage of health care professionals—robots are making their way into homes, hospitals, and assisted-living facilities. The global market for elder-care technology products is expected to reach $10.3 billion by 2020, according to a report by Research and Markets. In fact, a quiet gold rush is emerging in the form of health care robots, particularly for the elderly who desire to “age in place” by remaining in their own homes. Whether industrial or humanoid, in homes or in assisted living facilities, these robots can serve as extensions of health care teams. Startups and their supporters worldwide have recognized that this is a need, not a novelty, and have come to market with robots that connect patients to distant caregivers and assist with daily life. 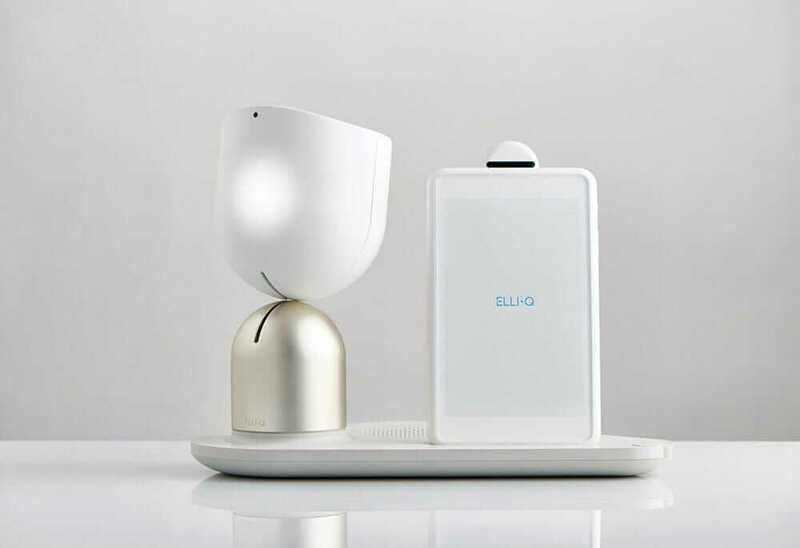 An example is elder assistant-companion Elli·Q, from Israeli company Intuition Robotics, which raised $6 million from iRobot Ventures and crowdfunding platform OurCrowd. Or AskMarvee, a voice-driven companion using Amazon Echo, from St. Petersburg, Florida–based Marvee; the unit was a finalist in 2017’s Innovation@50+ LivePitch, AARP’s two-day competition for caregiving technology startups. See how Fusion 360 helps OhmniLabs build robots. The Ohmni is an example of this “helper” technology that could be useful regardless of health care needs—many people simply want to stay better connected and more easily accessible to one another. But with seniors, social interaction is critical for maintaining physical and mental health. Another driver in home robotics is helping people maintain their independence. In 2014, startup INF Robotics introduced Rudy, a robot designed to help the elderly, war veterans, and people with disabilities. 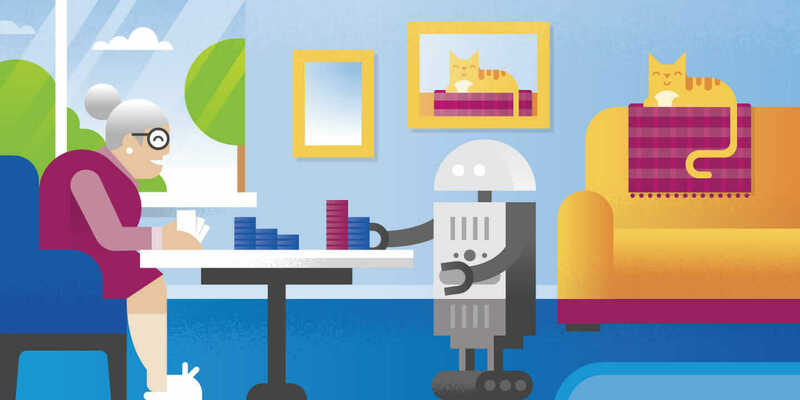 The robot—a smiling character the size of a 10-year-old, with arms, wheels, and a screen on its chest—is an in-home health care companion that gives medication reminders, carries things, and even interacts socially and plays games. Rudy also allows doctors and caregivers to check in, conduct visits, and operate it remotely. To improve elder care and extend independent living through technology, augmented reality in health care enables people to imagine what home life might be like in the future, and research is an essential part of that process. IBM Research has opened a new “Aging in Place” environment in Austin, Texas, in collaboration with Rice University. The space mimics future smart homes that will use sensors, the Internet of Things (IoT), and robotic technologies to assist elders with daily challenges. Their prototype robot is the IBM Multi-Purpose Eldercare Robot Assistant (IBM MERA), a Watson-enabled application designed to assist the elderly and their caregivers by monitoring vital signs, answering health questions, and detecting falls or other emergencies. With the increasing need for remote monitoring systems, more companies will surely enter the fray of helper and health care robots. With continued advances in technology, a new era is on the horizon: one with robots motoring around your home or your parent’s home, ready at the swipe of a screen.